The MSF solution is a key instrument towards the automation of the information and transactions made in a sales task. It also helps automate the distribution and service operations. MobileSF will gather vital information to maintain your sales services at the highest of standards. 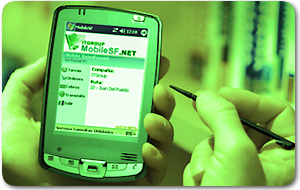 Mobile SF is used by numerous leading companies and interacts with hundreds of sales representatives daily. Mobile SF makes all of this possible by using advanced wireless data transfer that transmits and interacts on location with the sales representatives by the use of PDA technology and pocket PC. MobileSF is a complete solution that will allow your company to implement real mobility and flexibility towards the automation of your sales force. Our system will provide your company with an application that will completely integrate with your main ERP system and is capable of adapting to all the needs and requirements of your company.